Tauck published a 'First-Timer’s Guide to River Cruising' aimed at answering many questions common to prospective cruisers. The new 24-page, full-color brochure is available free at www.tauck.com/riverguide, where novice river cruisers can request a print or digital edition. Organized into Who, Why, What, Where and When sections, the guide provides information about the typical river cruise traveler, the reasons behind river cruising’s popularity and what a river cruise experience is like. The guide also includes notes on when to travel, the differences between Europe’s most popular rivers and information on why ocean cruisers and independent travelers ought to enjoy a river cruise experience. A two-page spread provides guidance on what travelers should look for when considering the wide array of river cruises available today. 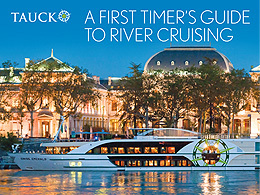 Tauck ceo Dan Mahar said the guide's primary goal is to educate those interested in learning more about river cruising, rather than simply promoting Tauck. But, not surprisingly, he thinks a knowledgeable, informed traveler will be more likely to choose a Tauck river cruise.